Last week, I began sharing my homemade Christmas gifts with you. I'm calling it the Necessarily Creative Christmas line because my creativity comes out of financial necessity. Well, and the fact that I just looooove a good craft. One of my absolutely favorite new websites is called Make It Love It. She does all kinds of amazing sewing projects which are usually way out of my league (I can hardly sew a straight line). But when she posted a tutorial for a fabric fishy purse, somehow I mustered up the courage to give it a go. And I'm so glad I did. This project was incredibly fun, rewarding, and actually pretty cheap, too! My nieces, Ellie and Cora, love animals, especially fish. 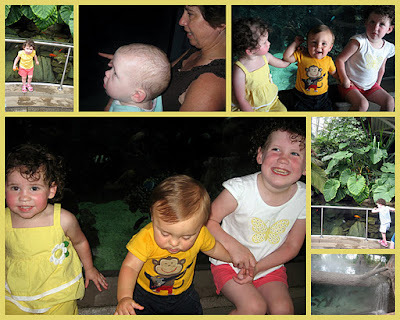 Some of my favorite memories with the girls have happened at the Baltimore Aquarium and Pittsburgh Zoo, not to mention all the beach trips we've taken together! Their daddy (Herb's brother) is somewhat of a fish aficionado, too, and they have a 6 foot tank in their house. And since they are little girls, I'm hoping they will appreciate having a cute purse. I wanted their purses to be similar, but a little unique to each girl, too. Cora LOVES anything yellow, and Ellie is more inclined to pink. I'm not going to reinvent the wheel and write down the directions, because they are all right here. All you need is a variety of fabrics (less than a yard, total, and you can probably use up a lot of scraps), 1/2 yard of fusible interfacing, 2 buttons, thread, a needle, a scissors, and a sewing machine. Oh, and a lot of free time. I am guessing I spent about 10 hours to make two purses. But again, I have a toddler who sleeps a lot and a husband who works three jobs. Oh, and did I mention how amazingly detailed the tutorial is? Here's what the purses look like all stretched out. And here they are ready to swim in the ocean. Now, please excuse me, I need to go find all kinds of fish accessories (crackers, stickers, candy) to put in their purses so they are ready to go to the aquarium!! Those are soooo cute! I wish I could sew-- or had time to learn!